Trifexis for Dogs protects petite dogs from fleas, heartworms, hookworms, roundworms, and whipworms. This chewable tablet features a scrumptious beef flavor that makes it easy to administer your pet's monthly dose. By combining spinosad and milbemycin oxide, this treatment combats parasites for a full month and begins working within 30 minutes of administering the first dose. 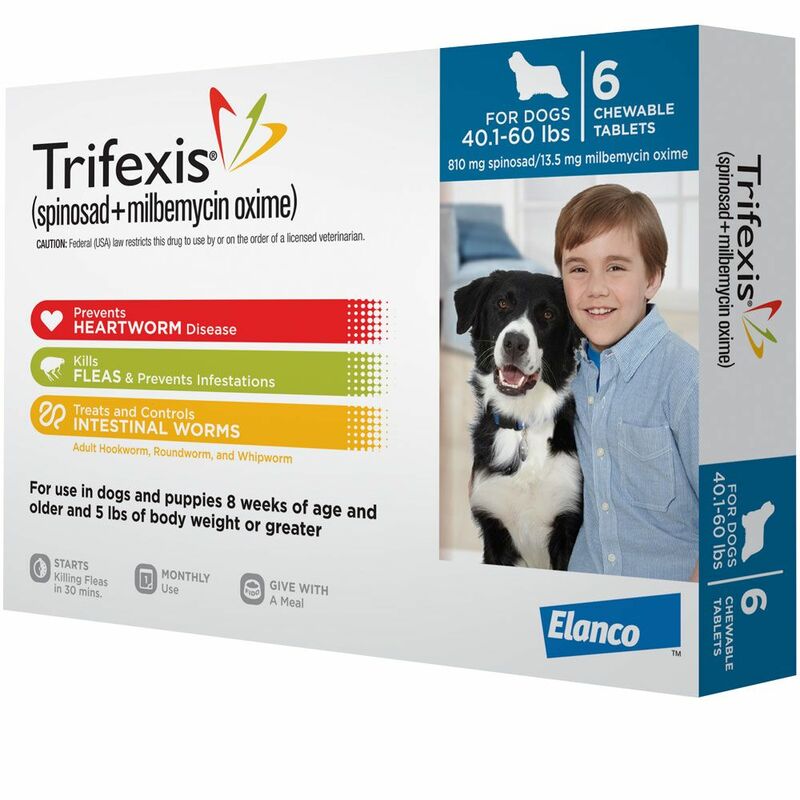 Triflexis is a prescription medication that is safe for dogs that are at least 8 weeks of age. 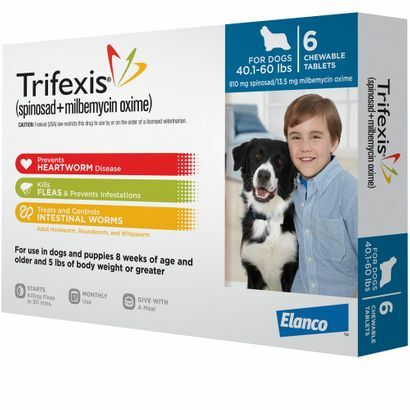 There are also five different formulations of Triflexis to give the proper dosage based on your dog?s weight. This pack includes 6 months worth of 140 mg doses for dogs that are between 5 and 10 pounds- but there are also dosages for dogs that weigh 11-20 pounds, 21-40 pounds, 41-60 pounds, and 61-120 pounds. View Trifexis Drug Facts Sheet. I have 2 dogs of different weight, and needed Trifexis for both. By ordering from Entirely Pets Pharmacy, I was able to split and order and get 3 tablets for each without having buy 6 for each dog at one time. ProsI was able to split and order 3 tablets for each dog. Pros She will take it with or without food, she has had no side effects, easiest alarm and easy to keep organized! Cons Man, that we have found so far! I've used Trifexis for our dog for 3 years. Works well and takes care of all issues with one monthly pill. This was a very good price and glad I ordered. I have used Trifexis for many years now. It is a winner. My pets are free of heartworms, fleas and ticks....which can be a major scourge in the south. Pros In the long run, this is more economical than buying separate treatments and I have not seen a tick or a flea on my dogs in years. I wish I wish I had this for Happy who contracted heartworms in 1975. She was finally cured but it was excruciating. They contact my vet for prescription. Then send product. Simple process. Our dog gets this everymonth for fleas and ticks-- she has never had them. Paid half the price of what I would have paid at the vet. Delivery was easy. Had it in a couple of days. Merchant Response:We get that a lot Connie. Happy to have you as a customer. Your service and prompt delivery sets Entirely Pets at a higher level of efficiency. Outstanding products and prompt delivery are provided. Merchant Response:Carlos, that's high praise, we do our best. If a dog doesnâ€™t mind eating a pill, this is the treatment I trust. I need to cut it in half and mix it in with his supper to get my dog to eat it. I couldnâ€™t get my previous dog to eat this pill no matter what I tried. Merchant Response:Ruger, Glad to hear your German Shepard does well with Trifexis. I was pleased with the customer service and the product I received. I will purchase from them again if they continue to offer great prices. Merchant Response:Debra, We work directly with the drug manufacturing companies to bring you the best pricing possible. We also do our best with our customer service. Thank you for the kind words. Wishing you and your dog the best! ProsThey deal directly with my vet to obtain the script. Great value and I will continue to purchase from them....much lower prices than our local vet. We have been using trifexis for quite a while and Entirely Pets offered the best price and the service was exceptional! In the past other services had long delays contacting our Vet and gave slow delivery.NOT HERE. Hope Entirely Pets gets the accreditation my vet likes to see to assure them that EP is totally trustworthy. Love this product. Very capable, professional customer service helped me through this transaction. Will buy from them again. Don't experience customer service like this must, especially online stores! Merchant Response:Eliza, we are happy to hear about your positive experience with us! Every day we try to be better than the last. Enjoy the Trifexis and take care! Good product, service an quick delivery. I was really amazed and pleased at the discounted price for the trifexis. Trifexis covers 3 parasites in one tablet. My Saint Bernard doesn't care for the whole tablet so I just crush it up on top of her food. Easy once a month dose. ProsOnce a month dosing. Easy to give. Love Trifexis. It covers 3 parasites in one tablet and you only have to give it once a month. My beagle eats it like it's a treat. No mess. Entirely Pets has the lowest price for this product. Happy to find a less expensive way to treat my animals. ConsNew customer so none yet. Hopefully never! Recently purchased Trifexis from EntirelyPets. Very pleased with the service received. Kept informed of order process and received phone calls to update when needed. I will definitely be ordering again from EntirelyPets. ProsVery friendly and helpful service. Prices were good, but just took a little longer than normal to get the fax request to the vet. But overall the service was good. Great product at a great price. Enjoyed the savings compared to the vets price. Fast service without any hassles. Merchant Response:Glad we're able to help save you some money Margaret while still providing the same great Trifexis you would get from your veterinarian's office! I like having my dogs protections in one pill. I don't like the topical flea treatments. ConsMy dog doesn't like the taste. Quick shipping after receiving the prescription from our veterans. Super price on one of the newest heartworm/ flea medications. Merchant Response:Thank you for the feedback Kenny, glad we were able to get the Trifexis to you quickly! Fast friendly service,saved me money!! Entirely Pets kept me updated all along the way from letting me know they had contacted my vet, when they got the prescription, when it shipped and asking if it arrived when it was supposed to. The process was extremely fast and my product was at my door in less than a week. Everything was perfect! ProsGreat service, wonderful product and excellent price. Ordering online has been so convenient for me and saving money also, This will be the only way I will order from now on. EntirelyPets is a friendly use website and I have recommended them to my family and friends.